Omega Giveaway Campaign began in 2012 with an objective to instill universal love for people whom we have not seen or met before; as our actions speak louder than our words. This gives students an opportunity to experience the happiness of sharing and caring, becoming empathetic to the needs of others. Students in turn learn to lead a simple and contended life. The objective of the OGC is for students to be inculcated in inter-personal skills that foster mutual co-operation, respect for others, and sensitize them towards the society, contribute to the well being of others and the environment. To meet the objective, students are involved in activities through the year. Students collect clothes in good condition, stationery items, toiletries, etc and thereafter sort and pack them in carton boxes. An orphanage or old age home is identified and the Omega family sets off to spend some quality time with the residents of the institute. Students take lead in various aspects of OGC that helps them to become self-reliant, hardworking, resourceful and conscientious in achieving excellence in the tasks that they undertake. Also, they learn to appreciate diversity in cultures and religions and encourage practical thinking, general awareness, managerial abilities and leadership skills that aid them in goal setting. With extraordinary support from students, teachers, parents and management, the Club is a success story and we hope to keep it thriving for years to come! Omega students visit Hope – a school for the mentally challenged, and joined with the residents to plant vegetable saplings for a Herb Garden. 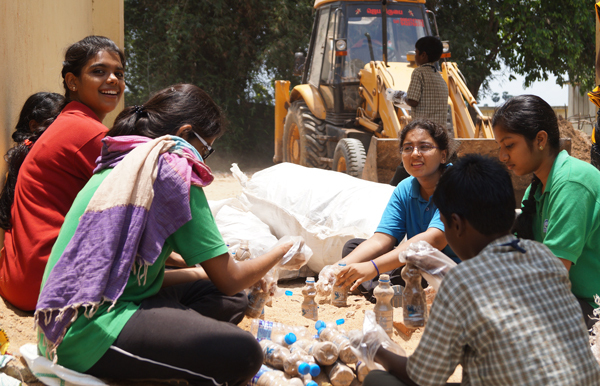 Omega students visit Siragu – a school for street children, where they organized various activities; including filling plastic bottles with sand to build the school wall. Students participate and contribute to various social causes, most recently to those affected in the Kerala floods of Aug 2018.